I really needed a long healing walk in the park this morning and I was lucky to get a perfect autumn day, with blue skies, crisp air, and crunchy leaves to stroll through. 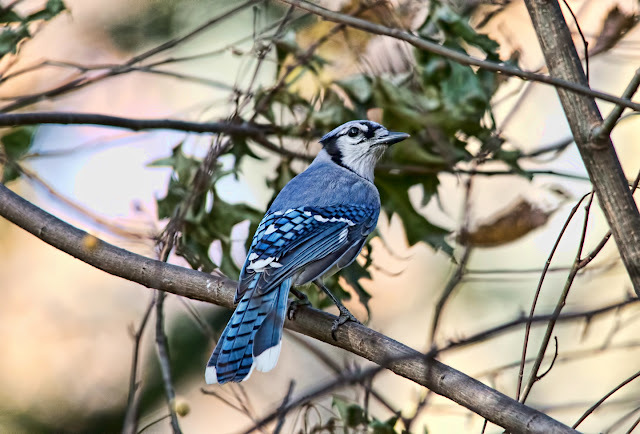 Migration's over, so the only birds were the common inhabitants -- cardinals, robins, titmice, sparrows, nuthatches, chickadees and woodpeckers -- but they were out in abundance. This is the only blue jay I saw but it was both beautiful and cooperative, so here you are.